Although I left Canada 17 years ago, I’m still very much a prairie girl at heart, and the land of the living skies is missed every day. Saskatchewan is a wonderfully diverse place that has many unique features. Some people think that there’s nothing to see in Saskatchewan, but with the wide open spaces of the south of the province, I would argue that you can see a lot more! Here are 10 fun facts about Saskatchewan, my home province. 1 ) Saskatchewan lies in the western half of Canada and has a unique shape in that it follows the lines of longitude and latitude, making it a geometrical shape. This shape makes it the easiest province for school children to draw! 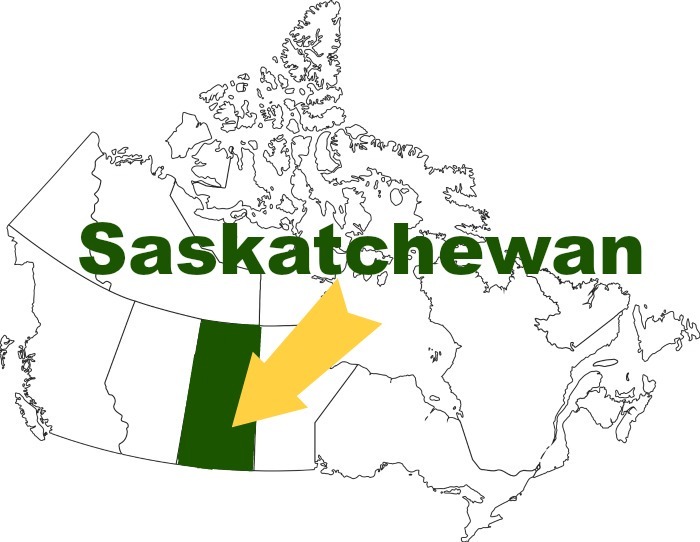 Saskatchewan is between the provinces of Alberta and Manitoba, and below the Northwest Territories and Nunavut. Across the border to the south lies the states of Montana and North Dakota. 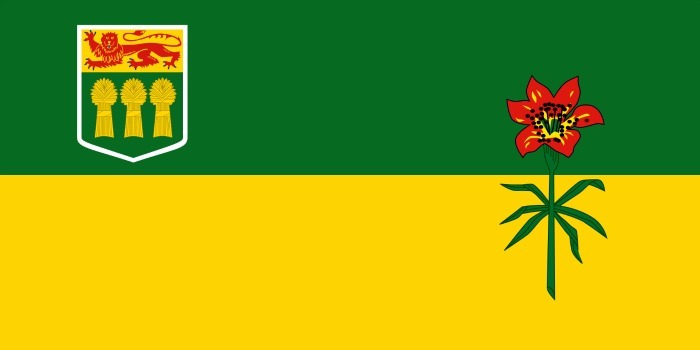 2) The official flag of Saskatchewan has been around since 1969. The green at the top represents the lush forests of northern Saskatchewan, while the golden lower half represents the southern grain farms. The flower is the western red lily, which is also the official flower of the province and is a protected species. 3) The slogan on Saskatchewan licence plates is “Land of Living Skies,” and no one could disagree that the incredible, massive skies aren’t an entertainment form in their own right. The skies are constantly changing as clouds roll by and sunsets dazzle. Many an hour was lost in childhood watching the skies for entertainment. 4) There are more roads in Saskatchewan than any other Canadian province with 26,000km of highways travelling the length and breadth of the province. The total road surface totals 160,000km, which is enough to circle around the equator four times. With the large size of the province and the relatively low population, that means there is more road per person than the rest of Canada. 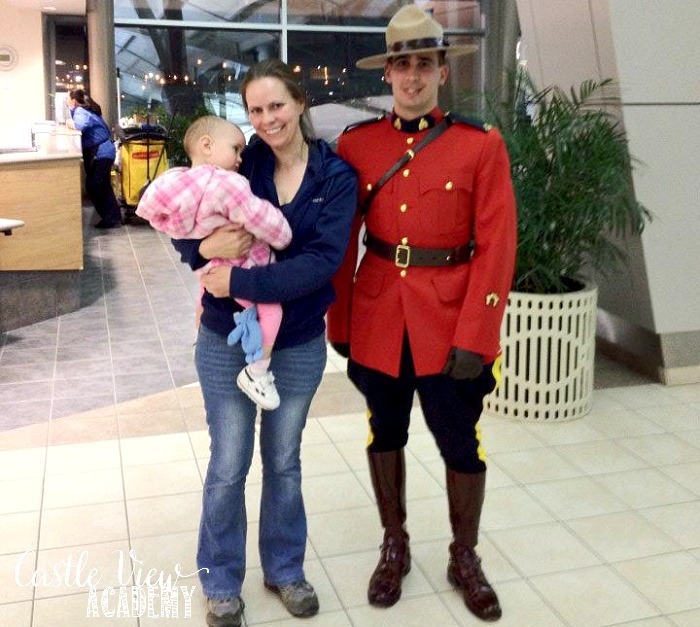 5) Regina, Saskatchewan is home of the Royal Canadian Mounted Police (RCMP), with each and every recruit spending their training time in the city before being deployed anywhere and everywhere across Canada. You can visit the RCMP Heritage Museum, and during the summer months you can watch their Sunset Retreat Ceremony. It’s rare to see an RCMP member in their Red Serge uniform outside of special ceremonies…but keep your eyes open and you just might find one when you least expect it! 6) The official mineral of Saskatchewan is sylvite; more commonly known as potash. Saskatchewan has enough potash to last hundreds of years if mined at its current rate. More than 95% of the potash mined in Saskatchewan is used for fertilizer. 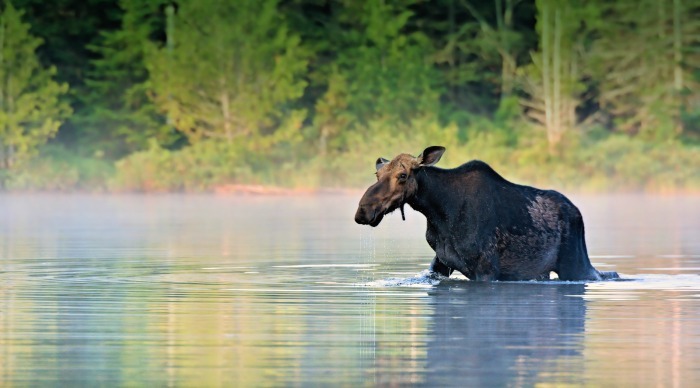 7) Although many people envision Saskatchewan as being flat farmland, if you venture up north, you will find yourself surrounded by forests and close to 100,000 lakes, and keep your eye open for wildlife! The water is clear and cool, and the fishing is great…unless you go to Manitou Lake, which doesn’t have any fish at all as it is so salty. This lake is three times saltier than the oceans and it is impossible to sink in it. Manitou Lake is known for its mineral and healing properties. 8) Spectacular sunshine is almost guaranteed in Saskatchewan, as it’s the sunniest place in Canada with over 2,000 hours of sunlight a year; Estevan, in the southeast of the province officially has the title with 2, 435 hours of sunlight a year. One thing I love about Saskatchewan is even during the long winters, it can be -40C outdoors, but the sun can still shine, turning the snow into a dazzling winter wonderland. 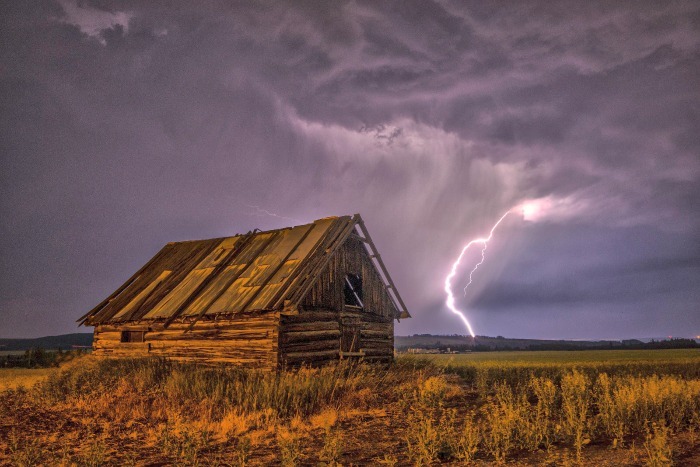 9) On the flipside of sunshine, Saskatchewan can also get its fair share of amazing storms. You can often watch them roll across the sky until they hit with force. As of mid-July this year, Saskatchewan had 15 tornadoes, only 1 less than Oklahoma. And the winter blizzards are not to be taken for granted, either as they can be dangerous when causing freezing temperatures and white-out conditions on the roads. 10) The longest bridge over the shortest span of water can be found in Regina. The Albert Street Bridge was built in 1903 and is 850 feet long, while Wascana Creek below is only a few feet wide. It sits next to Wascana Lake, which is a man-made lake near the Saskatchewan legislative building. 11) And a bonus fact: Saskatchewan was built on multiculturalism, and it still thrives today; after English and French, the most-spoken language in Saskatchewan is now Tagalog, even surpassing German and Cree over the past 7 years. There is a strong Filipino community in Saskatchewan, and the ties continue to grow. As much as there are stereotypes about Saskatchewan, (and most of them are true), there is a lot of diversity in Saskatchewan, in every way. Having grown up there, I miss it everyday and long to return to the wide open spaces and friendly faces of this ever-changing Canadian province. 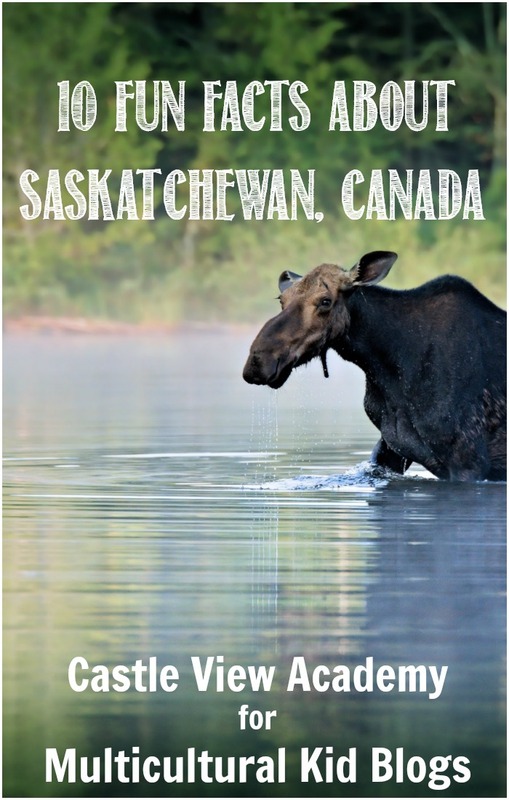 If you’d like to learn more, I have additional interesting facts about Saskatchewan on my blog. Check them out!